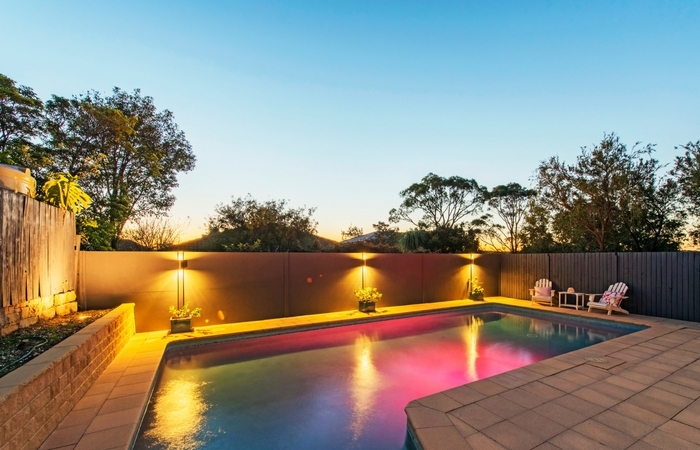 It’s the great Australian dream: to own a home with a spacious yard and a stunning outdoor pool area. Taking a refreshing dip or basking in the sun by the water is the epitome of a lazy Sunday afternoon for many. If you’re striving to revitalise this tranquil space, look no further! Be inspired with these creative pool ideas to morph your outdoor pool area into a serene outdoor oasis. 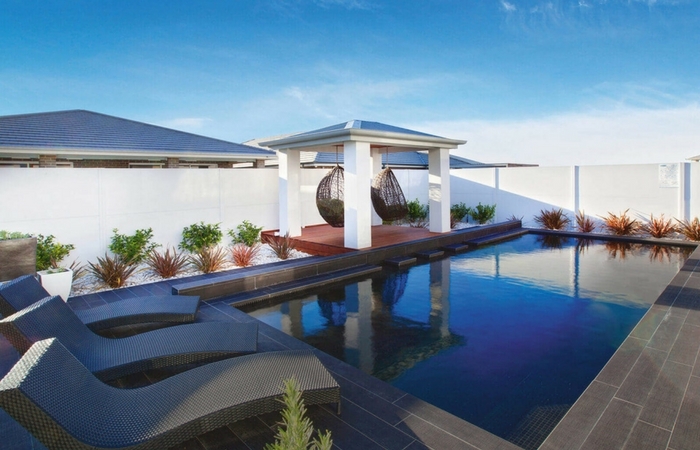 Outdoor gazebos are a classic pool area addition, reaching far beyond the traditional Bali hut. The covered space provides a peaceful reprise from the sun’s rays, whilst enabling you to relax in close proximity to your tranquil pool setting. For a gentle touch and soften the space, consider adding curtains or large cushions for a comfortable, homey touch. Add in a table setting and outdoor lighting to create an outdoor dining area to entertain guests! There’s surely no space more perfect than the gazebo to kick back, relax and enjoy a refreshing, summer-inspired cocktail. Sun umbrellas and parasols are generally poised on land, but why not create some shade in the water? Consider installing a pool umbrella that reaches over part of the pool; that way, you can enjoy perching in the water whilst avoiding unpleasant sunburn. They’re also perfect for those temperamental sun showers that frequent our Aussie summers! Bring the fun of resort life into your home with a swim-up bar or seating area in your pool. Better yet, pop a cooler box or low bar by the adjoined spa; there’s nothing better than some bubbles amongst the bubbles! Perfect for the avid entertainer and, if heated, can be enjoyed day or night. As well as being a peaceful escape, gardens can speak volumes about a homeowner’s personality and individual preferences. Sculptural forms create interest and variety amidst a sea of greenery and is the perfect way to personalise a space; weave your own unique spin and choose a statue that expresses your style. 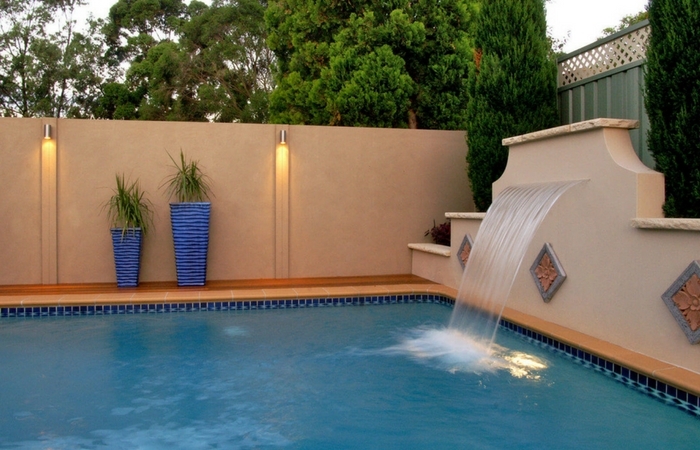 Bring a touch of the tranquil wilderness to your pool area with a waterfall feature. The meditative atmosphere created by a water feature allows you to unwind, relax and seek peaceful reprise from the daily grind. Serving as a key structural element in the garden, waterfalls also create a focal point amidst a sprawling array of lush greenery. 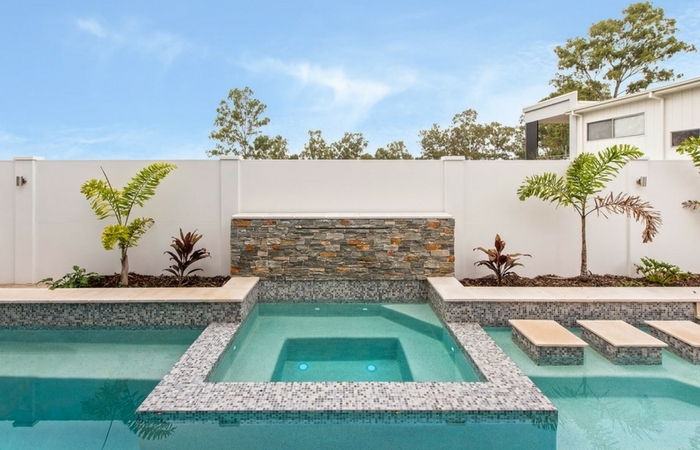 Sure to lift your spirits, swimming pool bridges will revamp the space and bring an element of creativity and charm to your private abode. Depending on aesthetic preference, homeowners can opt for a classic arched bridge, or a more contemporary choice. Don’t be afraid to explore the more modern designs, such as a flat concrete slab or series of wooden panels. A bridge at the deep end of your pool also provides an alternative platform from which to dive into the water, creating fun for kids and adults alike. For the perfect pool aesthetic, consider the backdrop upon which it is set against. Designing a statement feature wall can add style and connect the indoor and outdoor aesthetic. Make use of designer features such as tiles, garden beds, texture renders, mosaics, screens, wall art and lighting for a stunning finish. Weatherproof outdoor furniture has flourished with the invention of durable yet stylish upholstery fabrics. Swap the plastic deck chairs for comfy lounges or padded sunbeds for your lazy Sundays! Think outside the box; crochet hammocks add bohemian flair, triangle pillow mats store easily and four-poster outdoor beds are perfect for those with a glamorous side. Cost-effective with significant effect, lighting can transform your pool area into an enchanting and wondrous space. With the installation of a pool slide in the backyard, kids will forget the existence of technology for hours at a time. Instead, they’ll spend their days splashing in the swimming pool, creating lasting memories in the great outdoors. Who needs iPhones when spectacular wet n’ wild fun is on offer right in the backyard? Whether you’re trying to create a water park, an entertaining space or a tranquil, private lagoon, choosing the perfect finishing touches will ensure a space that you adore. Your personalised outdoor pool area will enhance your outdoor lifestyle and delight guests with the creativity and care of your customised oasis. 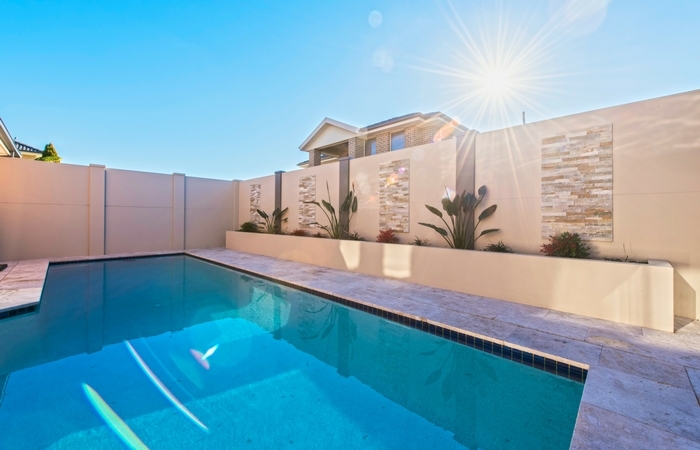 Create your own exquisite pool area with our customisable wall and fencing products that easily incorporate designer features, such as decorative screens and lighting. Get in touch with our in-house team on 1300 556 957, or simply enquire below.